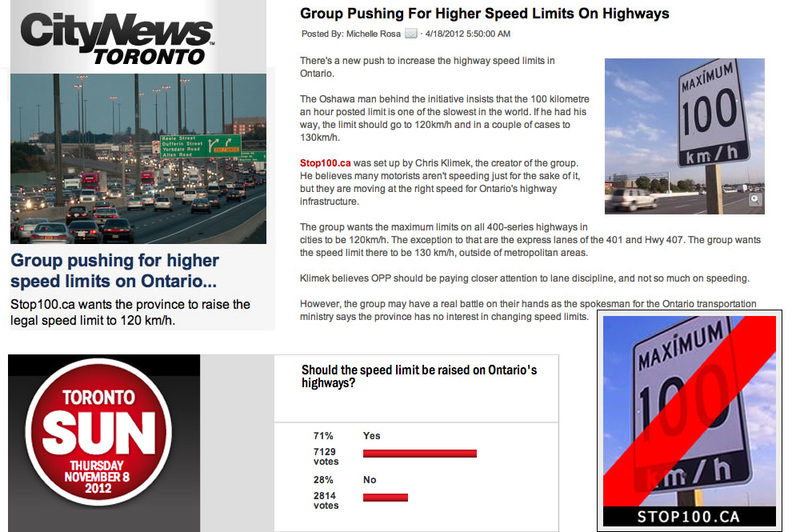 Ontario government posts very low highway speed limits. This turns virtually all drivers into lawbreakers. 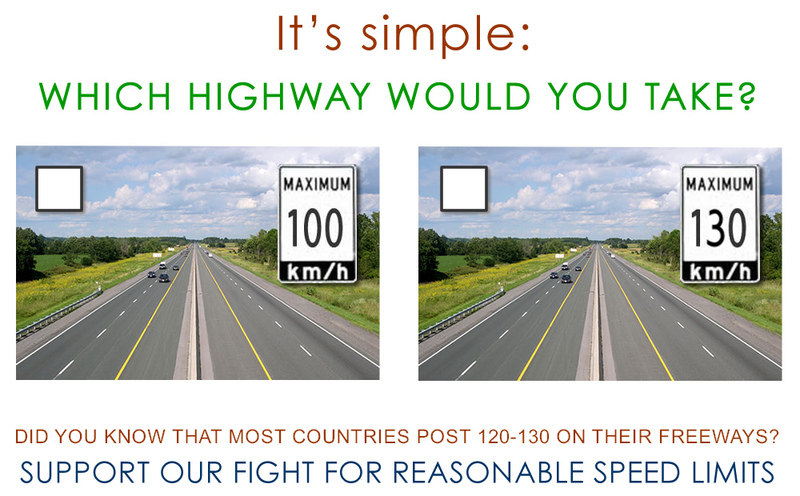 I SUPPORT 120-130 km/h SPEED LIMITS! WILL EVERYONE DRIVE AT 140? Join us to show strength and get updates! 100% of your donation goes to advertising! 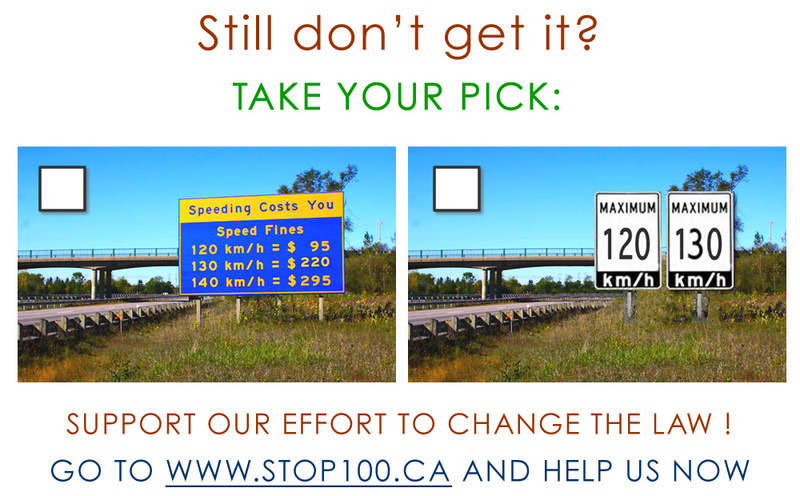 Help us reach all drivers in Ontario! I DEMAND 120-130 km/h SPEED LIMITS! The subject constantly gains media attention. We were featured in this October 2015 CBC Marketplace episode. 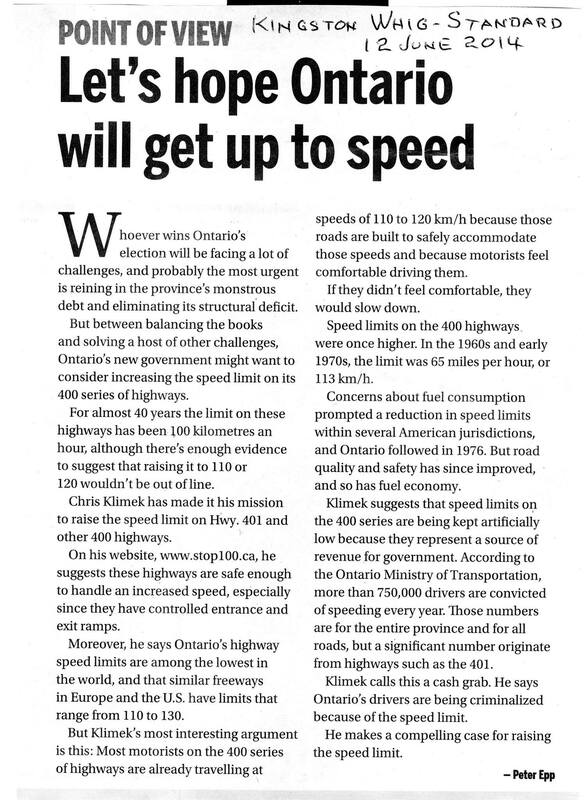 SPEED LIMIT ON ONTARIO'S 400-SERIES HIGHWAYS WAS 112 KM/H (70 MPH) FORTY YEARS AGO! 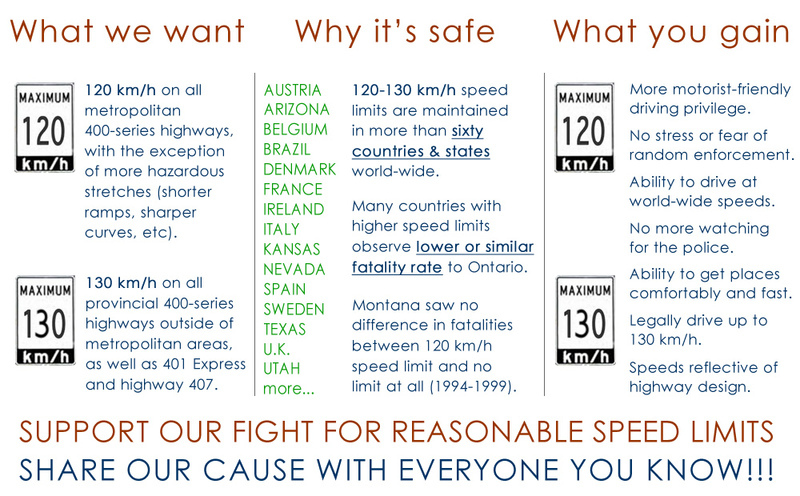 Help abolish poor speed limit law! 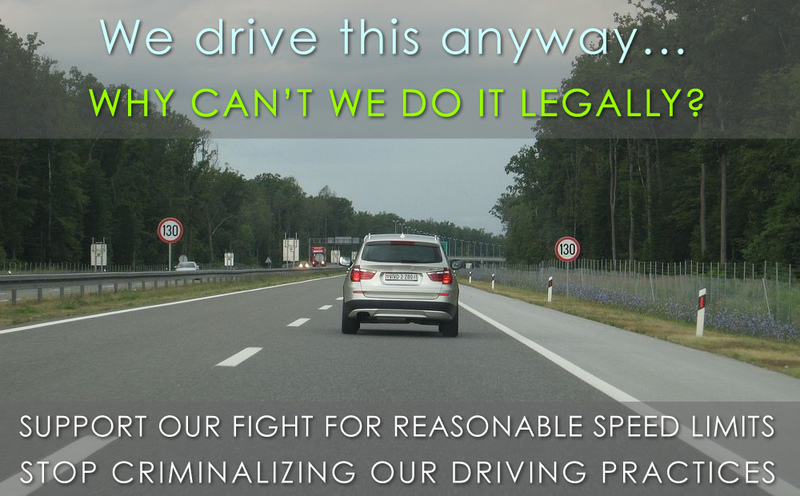 Legalize our safe driving patterns! LIKE US ON FACEBOOK TO SHOW SUPPORT! In the late 1960s and early 1970s the 400-series speed limit was 70mph (112 km/h). The limits were then reduced to 60 mph (98 km/h) in 1976 as a result of the 1970's oil embargo, political pressure from the USA to ration gasoline and widespread oil shortages. THIS SPEED LIMIT WAS NOT REDUCED DUE TO SAFETY CONCERNS, yet it still remains in place today. The USA, Germany and other countries affected by the aforementioned crisis have all since reverted their speed limits to new, higher levels. 130 km/h Austria, Croatia, Czech Republic, Denmark, France, Greece, Luxembourg, Netherlands, Romania, Slovakia, Texas, Utah. 120 km/h Belgium, Brazil, Finland, Ireland, South Korea, Serbia, Switzerland and most of the Mid-West and Western United States. It is notable that the limit of 130 km/h is successfully maintained in many EU countries with a much higher population density when compared to Ontario. It is also given a tolerance cushion making it acceptable (with small to no offence) to drive at 140 km/h. Speeds between 120-140 km/h are simply recognized as safe and acceptable around the entire world (with few countries posting 110km/h on the signs). 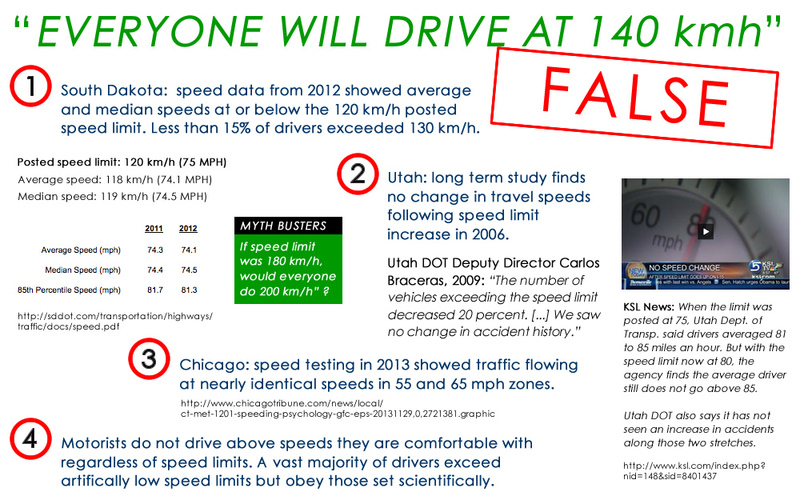 Many jurisdictions have extensively studied higher speed limits and found little to no negative effect on safety. The following are recent or upcoming changes in speed limits legislations. Most drivers prefer to flow at a very comfortable 120-130 km/h. Some drivers will feel comfortable at 140 km/h while some will insist on "obeying the law" and cruise at 110 km/h. Despite the average speed being much greater than the one legally allowed, Ontario highways remain some of the safest in North America, according to the MTO. 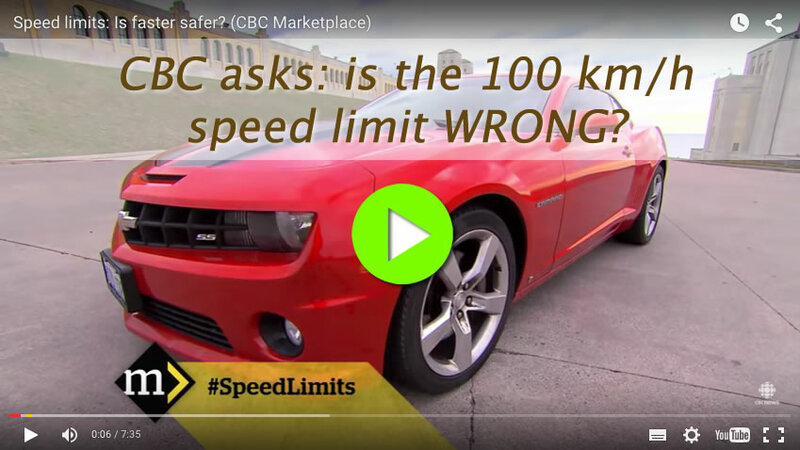 In reality, however, it shouldn't be puzzling at all - speeds in the range of 120-140 km/h are generally recognized as the safest and most appropriate for such well-engineered high speed roads. Even though the police might be understanding of the inappropriately set speed limits on our 400-series highways and generally be quite lenient on most drivers, the motorists never know if they will be ticketed at 115, 120, 125 or 130 km/h. They don't know whether next month their insurance will not go up by 10 or 20 percent for simply continuing to drive in the same way. Compliance would significantly increase with a more natural speed limit set in accordance to the road design and vehicle quality. This would relieve millions of drivers from feeling "criminalized" each time they drive and eyeing police parked on the shoulders, ramps or in the medians, which significantly reduces safety due to unnecessary driver distraction and anxiety. 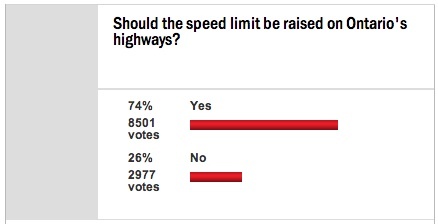 A higher speed limit would be recognized as one set for driver's safety and not out of politics. 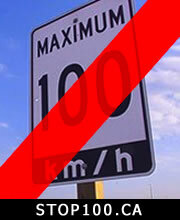 Drivers do not speed for the sake of speeding and do not always exceed the limit by at least 20 km/h as some may believe. The reason our speed limit is currently exceeded by a significant amount is because it is unrealistic and inadequate to the quality of our roads. With a higher, reasonable speed limit of 120-130 km/h most drivers will simply find themselves in compliance with the new law, rather than continuing to significantly exceed it. Speeds ranging from 110-140 km/h are the current reality on many of our 400-series roads. Such speeds are widely practiced not only in Ontario, but in most industrialized countries around the world today. 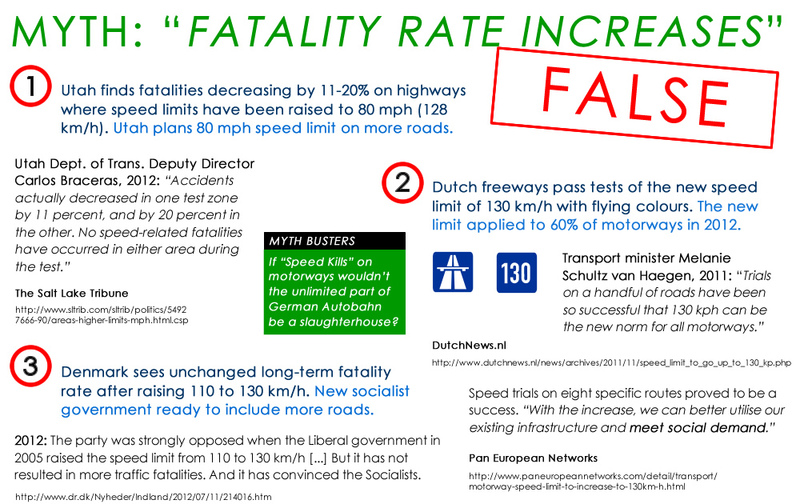 France, Austria and Denmark are just a few examples of countries with very comparable highways and safety standards to ours that have had a 130 km/h speed limit for decades. Is this campaign about allowing drivers to drive faster? We aren't ticketed below 120 km/h anyway. This will not change anything. 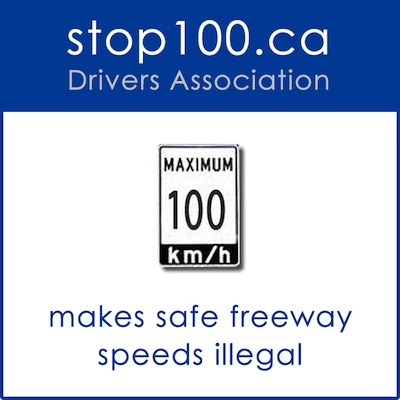 Legalizing 120 km/h will cause everyone to drive at 140 km/h. Our roads are too congested to increase the limit, we can hardly drive 100 km/h today. 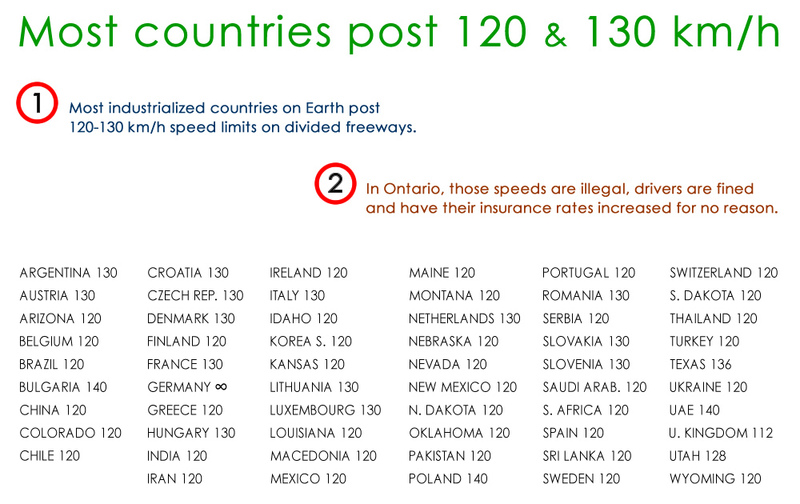 Higher speed limits are fine in EU and around the world, but not in Ontario with our horrible drivers. Why would we drive faster since cars will burn considerably more gas? NO! The purpose of this initiative is not to increase speeds on our roads. It is merely to legalize our current safe driving patterns which contribute to safe Ontario roads (one of the safest in North America according to the MTO). 120-125 km/h is widely agreed to be a safe speed for our roads - most officers confirm that by not ticketing drivers below those speeds. We therefore believe that 120 km/h (130 km/h outside metropolitan areas) should be the law! Since most vehicles today travel between 120-130 km/h we want to legalize such speeds and give drivers as well as police officers clearer rules to follow. We want to put a PROPER/REASONABLE number on speed limit signs instead of an artificially low limit that requires a wide tolerance to allow the roads to operate at speeds for which they were designed for. 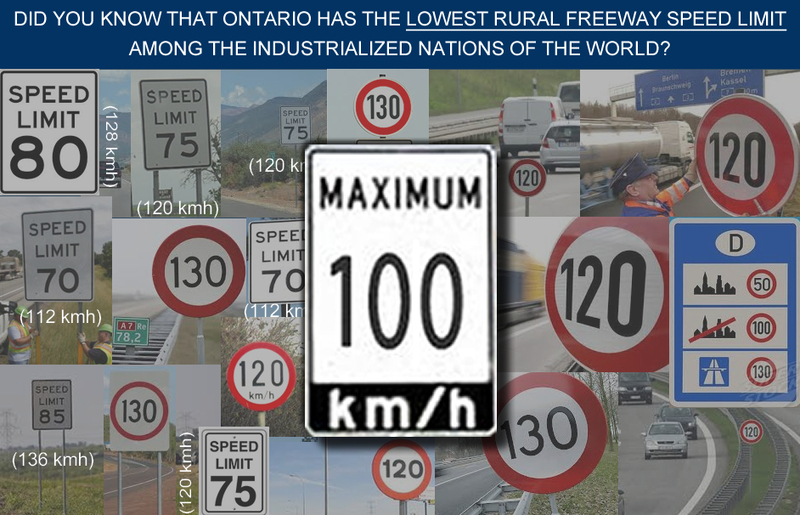 Speeds of 120-140 km/h are widely practiced not only in Ontario, but in most industrialized countries around the world today. France, Austria and Denmark are just a few examples of countries with very comparable highways and safety standards to ours that have had a 130 km/h speed limit for decades. Not all officers allow speeds up to 120 km/h. Some will ticket drivers for lower speeds. This only adds to confusion and lack of clarity, and most importantly - unnecessary slamming on one's brakes when they spot police. Even though 120-140 km/h prove to be globally agreed safe speeds, some drivers are afraid of braking the law. This frequently creates a situation where the left lane is blocked by a driver moving at 110-115 km/h out of fear of getting ticketed (that driver correctly thinks he is already driving fast and 'has a right' to be in that lane). This contributes to unnecessary risky situations on our roads - other drivers trying to pass on the right or tailgating the 'slow' driver. Both drivers and police deserve to have clear rules to abide by - instead of an unspoken, widely varying tolerance range we have today. The speed limit should be reasonable and the tolerance more predictable. Speeds ranging from 110-140 km/h are the current reality on many of our 400-series roads. Drivers do not speed for the sake of speeding and do not always exceed the limit by 20 km/h as some may believe. When the majority of drivers significantly exceed the posted speed limit, they're not showing reckless or irresponsible behaviour, but rather a strong desire to drive at the speed that's in line with the quality and design of the road and weather conditions (this is quite easily verified by observing the drivers willingly slow down to well below the speed limit in heavy rainfall or snowy/icy conditions). Given a reasonable speed limit legislation, one established in accordance with technical specifications of the road, the majority of drivers will simply find themselves in compliance with the new law, rather than continuing to significantly exceed it. The vast majority of motorists on no-speed-limit sections of the German Autobahn cruise at 130-135 km/h, despite being able to legally drive at 150, 200 or 250 km/h. 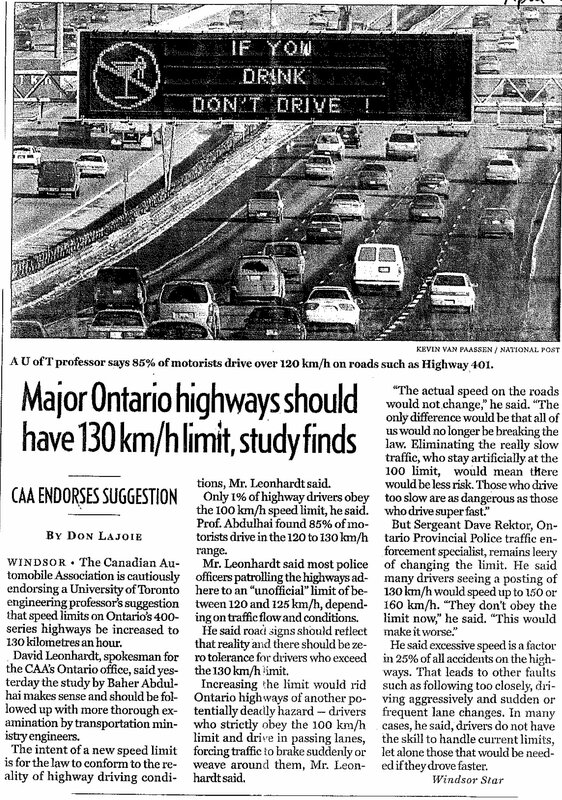 The unfounded logic stemming from the assumption that "at the limit of 120 km/h everyone will drive at 140 km/h" would suggest that with a speed limit of 140 km/h "everyone would do 160 km/h" and with the limit of 180 km/h, "everyone would do 200 km/h". This is quite clearly false. The reason our speed limit is currently exceeded by a significant amount, and drivers accused of "always breaking the limit by at least 20 km/h", is due to the current speed limit being unrealistically low and not matched to the quality and design of our roads. Speeds reaching 130-135 km/h are already very frequently practiced on our roads today. Most of our highways are designed for and very capable of such speeds - which is confirmed by the great safety statistics. Speed limit is not a minimum permitted speed. Current rush-hour driving conditions frequently do not allow reaching the legal speed limit and this situation will not change. On clear, non-congested roads, drivers will be able to legally drive at 120-130 km/h. Ministry of Transportation claims Ontario's roads are some of the safest in North America and the statistics confirm this. This is attributed to the very drivers who are so frequently criticized. Clearly, Ontario drivers deserve much more credit for contributing to such safe roads. While they could undoubtedly display a better lane etiquette (left-lane passing only or lane change signalling) such behaviour could be more strictly enforced by the Police. With a 120-130 km/h speed limit, motorists' driving habits will not need to change (since most drivers today don't drive below 120 km/h anyway). They can continue to drive at the same speed they currently are. This means their cars will burn exactly the same amount of gas. Those who drive more slowly can continue doing so safely in the slower, right lane. It is a personal choice of the motorists at what speed to drive. CityNews (video) Global Toronto (video) Toronto Sun Digital Journal Ottawa Sun NewsTalk Talk AM640 680 News The Oshawa Expr. 6/12: TEXAS ABOUT TO POST 85 MPH (136 KM/H) SPEED LIMIT ON A NEW HIGHWAY. 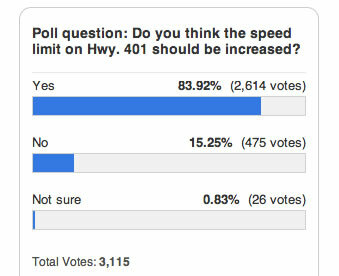 MTO TO POST 100 KM/H ON NEW 407 EAST EXTENSION? 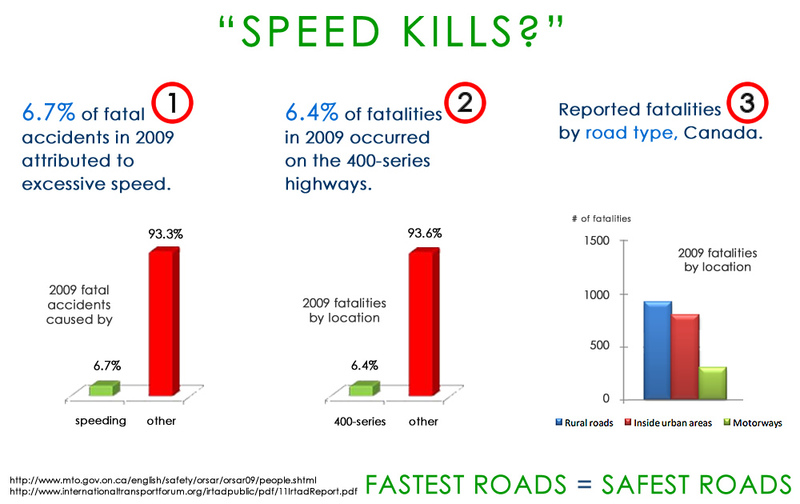 SPEED DOES NOT KILL on divided highways! Divided highways are the safest roads ever invented and designed! They are capable of handling much higher speeds with much less fatalities than slower city and secondary roads! Clearly, speed doesn't kill! 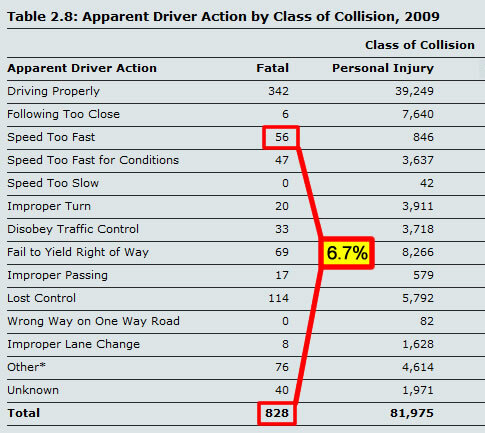 MTO's own data clearly shows that "Speed Too Fast" attributed to 6.7% of fatal accidents on Ontario roads! That's 1 in 15 accidents! 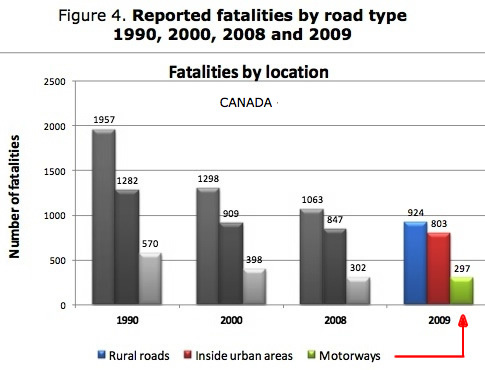 MTO Stats: Speed NOT a major cause of fatal accidents!